Real Novakane is a Comedian Actor Producer from Compton, CA who has done music for artist, plays, dramas, web series, and short films. 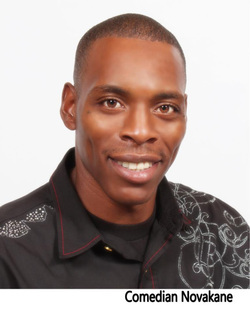 Comedian Robert “Novakane” Nelson is a very explosive comic with crossover ability for either bad boy comedy or main stream TV, and has been preforming for17 years, he prides himself on clean comedy and a sleek yet fun filed hosting style. Novakane has appeared in number of comedy show rooms, churches, and schools such as the Ha Ha café, Katt house live, the Cellar, the J – spot, comedy store, the Gigg lounge, Club Cheers, the Town House, Mavericks Flat, Club Cohibs, Comedy union, Comedy Store, Ontario Improv,Trinity Chapel church, Holy Tempo, and Grace Chapel, 112 elementary, 109th elementary, Wollowbrook middle school, Centennial high school, Compton high school, Compton College, LA South West college and USC. Novakane has also appeared in such plays like “Have you Heard the Word” by Elian Alexander,” The Bus Stop” by Lisa Dodson, and “Did You tell the children the truth” by Val Earvin, radio shows the Mrs. Jones Gospel show, and kjlh’s LV’s play list.